Now let’s add it to startup apps, Alt+F2 and type gnome-session-properties. Check the box for Gnome-Do. I am doing this because it’s option start at login does not work for me, try it yourself maybe it works for you. After that now let’s bind a keyboard shortcut. 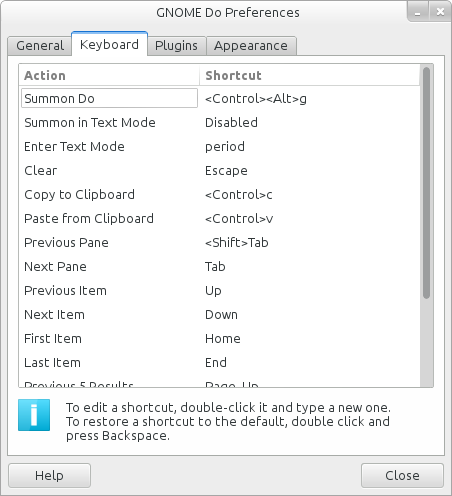 Open it’s preferences and go to keyboard tab, assign keys to Summon Do. Use that keys to fire up Gnome-Do every time. Cool na! Also you have not to worry about start, as we added it to start up apps. It will start as the system boots. So from there on you will only need to use the keys you assigned. After opening just type for the app, files etc. To add more locations/folders go to the plugins tab, search for files and folders plug and click configure, add as many folders/locations you want. Enjoy the freedom from mouse!